Little-known Taiwanese manufacturer Inhon is laying claim to the title of world's thinnest and lightest laptop after launching the new Blade 13 Carbon notebook. 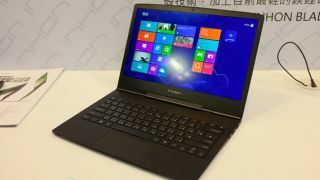 The 13-inch Windows 8 device boasts a slimline frame of just 12.88mm, which the company said is a full 2mm thinner than its nearest rival, the NEC Lavie X. It's also lighter than any other laptop ever, according to Inhon, weighing in at 1.9lbs (870g), which is a full pound lighter than the 13-inch MacBook Air and beats its nearest rival, the NEC Lavie Z, by around 5g. Despite its svelte Carbon frame, it isn't shy on including some heavyweight specs. It's got a 1080p HD screen, Intel i5 or i7 processors, upto 256GB of SSD storage and 4GB of RAM. International availability of the device has not been announced, but Engadget reports it'll go on sale for the equivalent of $1,350 in its homeland (around UK£886, AUD$1,314). There's also a cheaper fibreglass-built alternative, with a 1600 x 900 display that'll cost around $1,000 (UK$656, AUD$973), but that ups the weight to 2.6lbs.